Former Iowa State golf star Celia Barquin Arozamena was honoured Saturday prior to the school's football game against Akron. 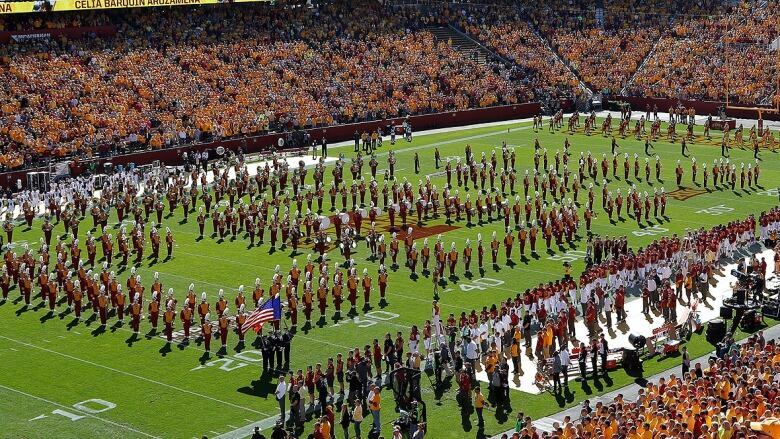 The Iowa State band spelled out Barquin Arozamena's initials — CBA — and a video tribute was played on the scoreboard prior to a moment of silence. Both teams wore CBA decals on their helmets and Cyclones coach Matt Campbell wore an Iowa State golf hat. The 22-year-old Barquin Arozamena was killed on Monday while playing a round of golf at Coldwater Golf Links near the Iowa State campus. Her body had several stab wounds to her head, neck and upper torso and was found in a pond near the ninth hole, according to police. Collin Daniel Richards, a 22-year-old homeless man, has been charged with first-degree murder. Prior to her death, Barquin Arozamena was scheduled to be honoured at the football game for being the school's 2017-18 female athlete of the year. A large number of fans wore yellow to the game with that being Barquin Arozamena's favourite colour. Linebacker Willie Harvey tweeted about Barquin Arozamena prior to the game. "Be with all of us today Celia, your legacy will forever live on & we are forever grateful for your impact. Much love from your #Cyclonitas," said Harvey, referencing the nickname Barquin used for her golf teammates. The native of Spain won the Big 12 Championship earlier this year and played in the U.S. Women's Open. She was working towards landing her LPGA Tour card.